First clean the rice a few times, rinse and keep aside. Then clean the Hilsha fish and cut into thick pieces. Rinse the pieces dry and marinate with turmeric, coriander, yogurt, and a little bit of salt for 5 minutes. And then heat about ¼ cup of oil in a pan and brown the onions. Then add the marinated fish pieces and cook for about 2 to 3 minutes over medium heat. Pour in ½ cup of water, and add the green chili. Keep over low heat. Then once the water dries up slightly and the gravy thickens, turn off the heat. And heat the rest of the oil in a separate pan, and fry the rice with ginger and the rest of the salt with 2 to 3 minutes. Cook the rice in 6 to 7 cups of water. When the water starts boiling, cover the pan and keep over medium heat. Then wait for 5 to 7 minutes before stirring the rice again and putting the lid back on. Turn down the heat to low now. Turn off the heat when the rice is boiled and the water dries up. And take out approximately half of the cooked rice and pour in all the fish pieces and the gravy. Now cover the fish with the separated rice and cook over low heat for 3 to 4 more minutes. Finally turn off the heat completely when the mixture looks thoroughly cooked, having a characteristic fragrance. 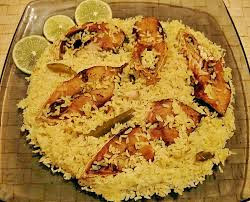 And serve this Ilish Polao any decorated plate or bowl.